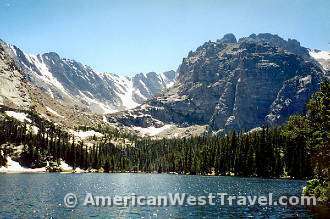 The snow covered peaks of the Rocky Mountains are at their finest in Colorado's Rocky Mountain National Park. The park offers a wide range of experiences, from broad valleys teeming with elk and deer, to gorgeous lakes at the foot of towering mountains, to the stark tundra world above timberline which comprises fully one third of the park. Above, a jagged crest of 12,000+ foot peaks as seen from the famed Trail Ridge Road, one of America's greatest alpine highways. 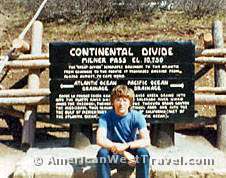 From this road which reaches an elevation of 12,183 feet, any visitor can experience the alien tundra world at the "roof of the Rockies". Below, your AWT photographer is photographed enjoying the park over the course of a lifetime. 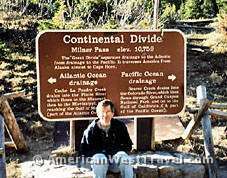 The locale is the Continental Divide at Milner Pass, elevation 10,758', on Trail Ridge Road. The Trail Ridge Road can offer excitement beyond spectacular scenery. The stark region above timberline is cold and exposed to all extremes of weather. On our early morning transit following the passage of a cold front, we enjoyed sustained hurricane-like winds. The winds made it nearly impossible to hold a camera steady. Note the crooked photo, (left). The east side of the park features spectacular mountain scenery and great day hiking. Many beautiful alpine lakes are within relatively easy access of the parking lot. 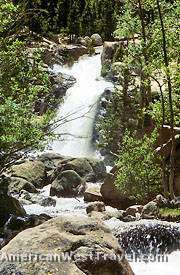 Trails often follow alongside scenic streams. One very popular trail passes spectacular Alberta Falls (right) on the way to The Loch, a pristine alpine lake at the foot of towering, snow-covered peaks (below). The western side of the park features large, verdant valleys with many opportunities to view wildlife. 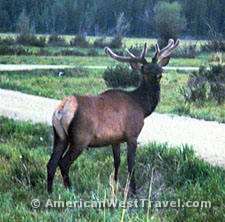 Elk and deer are especially plentiful in the late spring and early summer, grazing the valleys. Many deer and elk passed by our camp site in the Timber Creek campground at daybreak. The fine elk (at right) was not especially shy about posing for a closeup. The photo was taken on the road (now a foot path) to the historic Never Summer Ranch, a popular tourist camp in the early part of the 20th century.